_Chainway is a content creation and distribution platform that aims to give digital content shared online a physical presence in the neighbourhood. 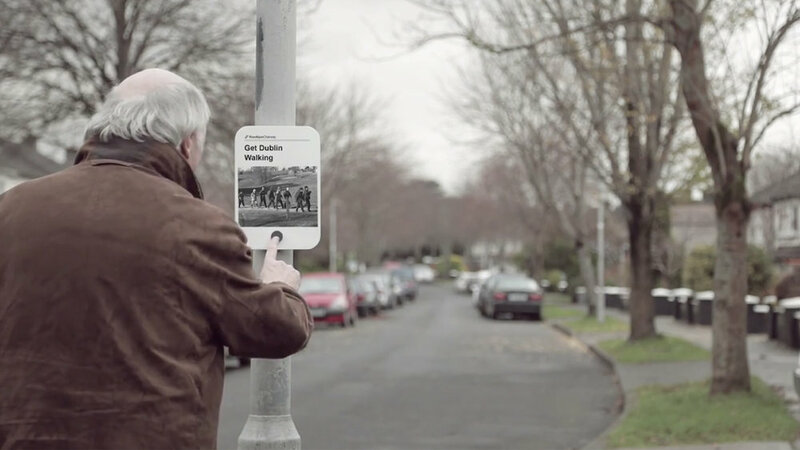 A distributed network of E-Ink screens display the thoughts and knowledge of the community publicly for everyone to access, traversing the gaps between those who are connected, and those who are not. More and more suburban communities have social media platforms to manage and distribute information; however those in the community whom are not online are left in the dark and have to rely on information being spread by word of mouth. This causes disconnect in the community. This project started out by looking at the systems in place in our communities. It began with an investigation of the neighbourhood watch scheme but what we discovered was that this ‘self help’ method of crime prevention was actually all focussed around community connections in a big part hindered by communities where neighbours don't know each other as well as difficulties in managing and distribution information. We started by doing on street interviews asking members of the public about their communities. Most members of the community talked about the elder generation living in the community. The elders are the pillars of most communities and they are the main ones being left out of community conversations as they are being held online. They have to rely on their neighbours to tell them what is going on or they take to the notice boards located in church or the community centre. "A lot of people would tag others in posts and say 'Say this to your Mam' because their are a lot of people not online"
We talked to people who are or have been involved in community interest organisations such as residents associations. Our main connection was the Knocklyon Network. We sat down with the ex Chairman and gained insight into the role the Knocklyon Network takes on for the community. We gathered a sense of behind the senses of a community Facebook page and the content that people want to see, share or publish. We were also lucky to sit in on a weekly meeting the Knocklyon Network provide for members of the community to get more involved. They viewed their work as vital for improving community relations but it is often difficult to get people involved in the organisations as it requires a lot of time investment from individuals. We again saw how older people who are not on social media are left out. "The Knocklyon Network website helps to unify the area and raise important issues"
As a group we agreed to concentrate on getting the information being spread online to be shared amongst the communities everyday routine; but what shape will it hold? As a group we had a rapid prototyping session where we took our aim and thought about different ways to represent content in a realistic setting, not allowing it to become speculative in any way. We gathered materials and split up to make three prototypes in the time we had. We each took a community member to design for, I was concentrating on a neighbourhood watch member who was doing all the Facebook updates himself. I decided to make a changing sign for the members of the community to check up on any neighbourhood watch news/alerts by using an RFID card. We decided to look a trail of new letter posts around a community. Each post will be shown on an e-ink tablet and the community will have a say on what gets show on the tablets through the website provided on a residents association page. We make cardboard prototypes and placed them in the halls with fake news on each on to see if people stop and interact with the boards. As I was the only one on the team with a product design background the final model of the tablets was left to me to design and make. We left the e-ink graphics to be shown in our video as it was a short project. This project was the first time I had done a service blueprint and as we had different aspects to this service I ended up doing up three service blueprints make the layout clearer. Started the service blueprint was challenging but I was a good learner curve to figure out the step by step workings of the service. I laid out all aspects of the service on the wall with post it notes first and talked my team through it to make sure we were all on the same lines of our service. I then fleshed it out and made three digital versions of each user. UI for both the mediator and the composer. The composers side is an easy fill in template system making it more inviting to use. The mediator has the job of filtering through post and seeing the range to share with the addition of stand in post in case there is ever a lack of new posts for that week. User flow I did to show the steps involved and the simplicity of use.